Another month has ended. July seemed really quick, and full of changes. Personally, I started a new job part-way through July, and have seen a definite decrease in free time and reading time. A direct result is I have read a lot fewer books. I have concentrated on books I committed to read by a certain datem which took up most of my time. I did slip a few other books in, and a few audiobooks now that I have a commute again. Audiobook Challenge – 14/20 – listened to 5 this month – I changed my goal from 12 to 20. Canadian Book Challenge 5 – 3/13 – 3 read this month – Challenge started July 1. – Giveaways galore! There will be at least one giveaway open every day! The giveaway alert at the top of the blog will list the currently open giveaways. 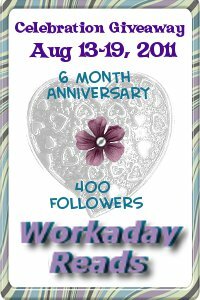 – I am celebrating 2 awesome milestones. I created a special badge for it last night, and have to share it now. I can’t wait until the celebration actually starts. Even though I don't have a job (outside of taking care of my two kids) I don't get that much reading done. 🙂 Congrats on your July totals!